Despite pleas from teachers who recently went on strike, the School Education department has decided to take disciplinary action against them. In a bid to collect accurate data on the number of teachers who took part in the strike, the department has asked Chief Education Officers (CEOs) to submit a ‘strike report’ on Educational Management Information System software. This decision has disheartened government school teachers, who had requested the State not to take disciplinary action and repeal their suspension. Several teachers, who were suspended during the strike in January, have not been allowed to rejoin duty, until the department completes its inquiry against them. 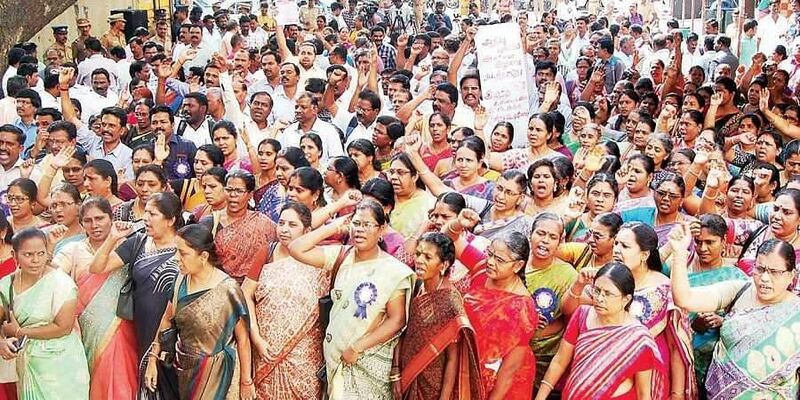 In a circular issued to all CEOs on Monday, Director of the School Education Department Rameswara Murugan instructed them to collect details of staff who participated in the strike between January 22 and 30 through respective District Education Officers and upload the same onto the EMIS portal. A database of all schools and teachers in every district is available on the portal. Officials would merely have to select the names of teachers and check the box against ‘participated’. The officers will then have to choose the dates on which the teachers took part in the strike. “Action will only be taken against those teachers who participated in the strike despite being warned for eight days,” said a senior official, estimating that roughly 4,000 teachers across the State could be taken to task. “We ended the strike on the CM’s request. We did not want students to suffer. Now, we want the government to consider our welfare,” said T Elangovan of JACTTO-GEO. He said that the government should not penalise teachers for making reasonable demands. “We would have called off the strike much earlier, if the State had held talks with us,” he said. The strike, which started on January 22, kept nearly a third of all government employees away from work during the initial days. Tamil Nadu government should withdraw departmental action against members of JACTTO-GEO, who struck work a few days ago in support of their demands, TMC (M) president GK Vasan, has said. In a statement, he said the protesters are facing problems in discharging their duties as departmental action taken against them, has not been revoked, he said in a statement.